PARIS: Animals living in the deepest ocean trenches have been found with plastic fragments in their gut, according to new research published Wednesday showing how manmade pollution reaches into the bowels of the planet. More than 300 million tonnes of plastics are produced annually, and there are at least five trillion plastic pieces floating in our oceans. Because deep-sea exploration is expensive and time-consuming, most studies on plastic pollution up until now had been close to the surface, showing a widespread level of plastic contamination in fish, turtles, whales and sea birds. Now a British team of researchers say they have discovered cases of plastic ingestion among tiny shrimp in six of the world’s deepest ocean trenches. In the Mariana Trench east of the Philippines, the deepest depression on Earth, 100 percent of the animals studied had plastic fibres in their digestive tracts. “Half of me was expecting to find something but that is huge,” said Alan Jamieson, from Newcastle University’s School of Natural and Environmental Sciences. Jamieson and his team normally spend their time looking for new species in the depths of the ocean. But they realised that during the course of expeditions dating back a decade they had accumulated dozens of specimens of a species of tiny shrimp that lives between 6000-11,000 metres (19,500-36,000 feet) beneath the surface. They decided to look for plastic. “We are sitting on the deepest dataset in the world, so if we find (plastics) in these, we are done,” Jamieson told AFP. The team was astonished by just how widespread the plastic contamination at extreme depths proved to be. For instance, the Peru-Chile Trench in the southeast Pacific is around 15,000 kilometres (9,300 miles) from the Japan Trench. Yet plastic was found in both. “It’s off Japan, off New Zealand, off Peru, and each trench is phenomenally deep,” Jamieson said. 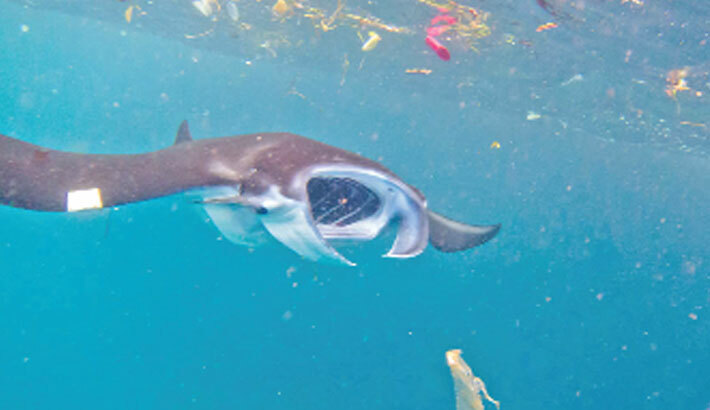 Of the 90 individual creatures the team dissected, 65 — over 72 percent—contained at least one plastic microparticle. The study, published in the journal Royal Society Open Science, said it was unclear if the particles had been ingested by fish at higher depths which then died and sank.